Brands can engage with their customers and drive brand loyalty by building branded apps that offer useful or entertaining information. Examples of branded apps include airline apps that provide check-in functionality, banking apps that provide bill pay and check deposit, and retail loyalty apps that drive in-store purchases. By providing functionality that people need regularly in a convenient way, these brands are able to remind customers of their value proposition and build stronger relationships. But to get this customer loyalty, you first need to get people to install your app. App install campaigns help you promote your app to your customers, so they can discover and install it. Having your branded app on your customers’ phones means you can be front-and-center on the screen that people check over 150 times a day, leading to increased brand awareness and mindshare. 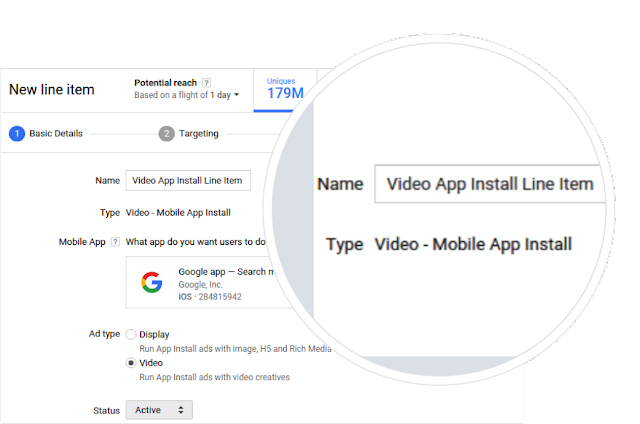 Today, we’re excited to announce several new features across our DoubleClick Digital Marketing solutions that help you easily build an app install campaign to promote your branded apps. Before you launch your app install campaign, make sure your app is setup to track installs (and other in-app actions your customers may take), so that you can understand which ads are most effective. If your app is in the Google Play Store, you can now automatically track installs of your Google Play app as conversions in DoubleClick, without any code changes. If your app is in the Apple App Store or if you work with an app measurement provider, we support integration with popular third party app tracking platforms (initially announced in September), so that you can track installs measured by those systems as conversions for your campaign. Your customers are viewing content across search, display, and video, so your app install campaigns need to reach them in all those places. Use the new templated app install creative formats in DoubleClick Bid Manager to generate your programmatic display ads instantly. These templates pull in info about your app from the Google Play or Apple App Store to create app install banners at the click of a button. Build, traffic and serve one rich media unit that works seamlessly across web and app environments, with universal ads, now available in DoubleClick Campaign Manager. Through DoubleClick Search, you can access some of our highest performing ad formats; app install Search ads, launched last May, promote your app on Google Search results or on Google Play Search (Android only), and our new app extensions allow you to link to your app from your Google Search text ads. Create custom lists of apps to ensure that your ads show up in the apps you care about or that drive the best performance -- easily target or exclude lists of apps, giving you control over where your brand shows up. Already have an audience list of customers who’ve visited your mobile website? Use same device targeting to reach those interested customers with your app install campaign. Leverage the audience targeting solutions within DoubleClick Bid Manager (launched in November) for your app install campaigns, to reach your customers using in-market audiences, affinity segments or demographic groups. Drive higher performance and engagement with video ads; we’re launching a new video app install workflow in early March that enables easy campaign setup and targeting of video app inventory across the open exchange. Running app install campaigns can help drive more customers to your branded apps, paving the way for a deeper connection between your customers and your brand. Talk to your media agency and DoubleClick sales rep about getting started with these campaigns.